A regional bank has to walk a fine line if it wants to provide high returns on equity safely. Among large bank stocks, Huntington Bancshares (NASDAQ:HBAN) has a pretty impressive valuation. The market values its shares at a premium to the bank's book value, a feat achieved in today's environment only by top-quality institutions. For context, two similarly sized large regional players, Comerica Incorporated (NYSE:CMA) and CIT Group (NYSE:CIT) each trade below their book values, at 0.88 times and 0.57 times, respectively. There are hundreds of reasons one bank could be valued higher or lower than its peers, but if you had to focus on a single number in today's market, it would be return on equity. Return on equity is significant because it is the best fundamental proxy investors have to approximate the return on investment they should expect when they invest in the stock. Banks' earnings must cover their expenses with enough left over to satisfy their investors' expectations for return. If a bank produces strong returns on equity, it follows that more investors would want to own its stock, because the institution has more leftover cash to invest in growth, pay dividends, or buy back shares. If return on equity is low, the inverse is true. As the chart below summarizes, Huntington is generating better returns on equity than its peers, and that correlates well with its higher price to book value. *ROE for U.S. banks with more than $10 billion in total assets, sourced from the FDIC's fourth-quarter 2015 Quarterly Banking Profile. Price to book value via YCharts. The comparison between Huntington, Comerica, and CIT is illustrative of two key considerations bank managers must manage to optimize returns on equity: credit risk and leverage. Let's start with the most important discipline for banks: credit quality. Comerica, unfortunately, is an example of a bank struggling to deal with a concentration of loans on the fritz. Its portfolio has a relatively large concentration of loans to businesses in the oil, natural gas, and mining industries. These sectors have been hit hard by low commodity prices over the past 18 months, causing many companies to lose profitability and fall behind on their payments. When loans go bad, banks are required to set aside reserves to protect themselves from potential future losses. Those loan loss reserves are accounted for as an expense on the income statement, balanced by an increase in the reserve account on the balance sheet. If a loan loss exceeds the amount reserved, the bank must recognize even larger losses on top of what was already reserved. Across a large portfolio, these losses can quickly overcome a bank, straining both profits and capital. For Comerica, the exposure to the oil and gas industry has forced the bank to significantly increase its loan loss reserves in recent quarters. In the 2015 fourth quarter, the bank put aside an extra $35 million in credit loss provisions, up from just $2 million in 2014's fourth quarter. The bank earned $149 million in net income in the fourth quarter of 2014. The 2015 fourth quarter only produced $130 million. The impact of the extra $33 million in reserves is, in this context, clearly significant. Controlling for the impact of these new loss provisions, Comerica's performance wouldn't be too dissimilar from Huntington's. 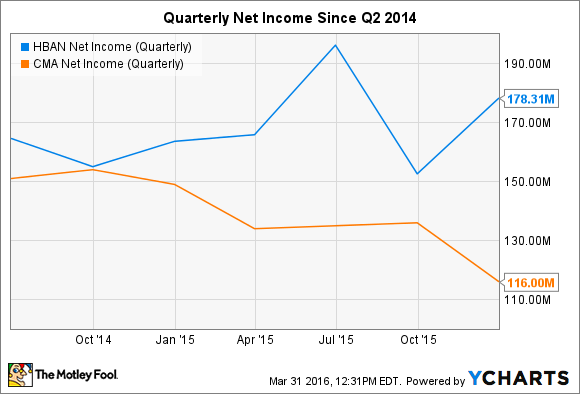 HBAN Net Income (Quarterly) data by YCharts. Using a sample of 59 large U.S. banks, the industry averaged a return on assets of 0.9%, on a trailing-12-month basis, as of the fourth quarter of 2015. For context, that compares to nearly 20% return at Apple. The point being, bank assets don't generate very much income -- certainly not enough to satisfy investors without something else to sweeten the pot. To achieve sufficient returns, banks must use leverage. Leading up to the financial crisis, banks took this too far, leaving their balance sheets vulnerable when the economic shock arrived. However, if banks don't use enough leverage, their returns will fail to reach a level suitable for to lure investors. CIT Group is a good example of this. CIT was hit hard in the recession and, ultimately, forced to reorganize. It was a bad situation for all involved. As the bank has reemerged over the past few years, its use of leverage has been very conservative, impairing its ability to generate returns on equity. As of the fourth quarter, CIT had an asset to equity ratio of just 6.1 times, well below Huntington's 10.8 times and the industry average of 9.2 times. *ROA for U.S. banks with more than $10 billion in total assets, sourced from the FDIC's fourth quarter 2015 Quarterly Banking Profile. Industry average leverage ratio from sample of 59 large banks, data provided by S&P Capital IQ. If CIT were to utilize leverage closer to the industry averages, its above-average 1.8% return on assets would likely translate to a strong return on equity. Instead, its lack of leverage is producing the opposite effect. For investors, Huntington Banchshares today is doing an impressive job managing all of the levers needed to optimize its return on equity machine. Its credit-quality metrics are quite acceptable, and it's using leverage prudently to maximize returns. As a result, the market is rewarding the bank with a healthy valuation.